On Saturday 12th May, GoBike, Friends of South City Way, Space for People Byres Road and other local community groups and individuals will ride down the short stretch of completed segregated cycle lanes on Victoria Road with tea, coffee, cake and tattie scones for the people working on the lanes. We want to thank them for building active travellers in Glasgow a safe space to get them from this area of the south side towards the city centre. We also feel it is important to show other projects in the city that segregated cycle lanes are what people on bikes need, on new and redeveloped streets. Final plans for the Byres Road redevelopment are shortly due to go public and GoBike are very concerned that these will not provide a segregated cycling space for people on bikes. 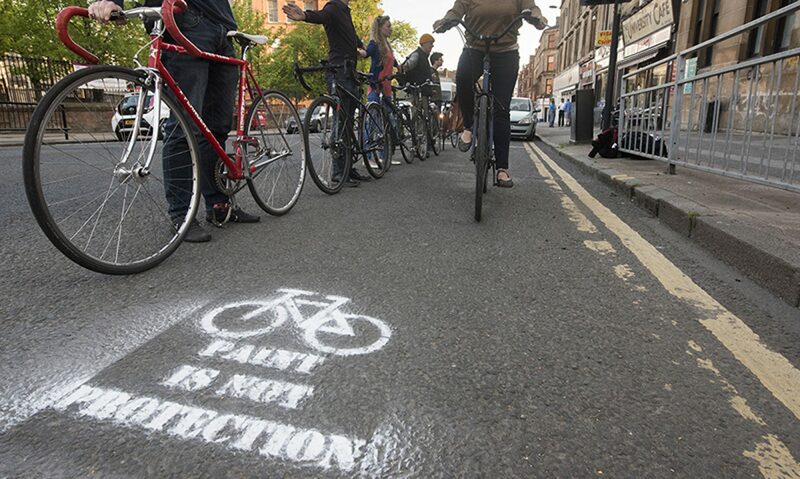 Help us show Glasgow City Council that we support safe spaces for cycling, and that we believe that they should feature in every project going into our roads. This is an open invite for everyone to join us to show support. We leave from the gates at the entrance to Queens Park at the top of Victoria Road at 11am Saturday 12th May. Hopefully see you there!